Since the advent of the Metropolitan Transportation Authority (MTA), which brought the subway to L.A. County in 2000, a change has been on the rise in the NoHo Arts District. On its way to being a transit community, in large part due to the subway bringing in 34,000 people daily, the Arts District is steadily growing with more restaurants, theaters, apartments, dance and recording studios, and even a farmer’s market peppering an area that used to be plagued with gangs and graffiti. But while the ushering in of a well-received arts community has upgraded the popularity and property values of the community, the upgrade has fallen short regarding some of the moral values people have in and around the growing neighborhood. It would seem the old adage “the more things change, the more they stay the same” rings true when discussing crime in the NoHo Arts District, as the gangs and graffiti have been traded in for car break-ins and burglaries. Yes, such opportunities for new businesses as well as new customers have created big breaks for new criminals as well. And it’s this move away from the homicidal, into the direction of non-violent crime that creates new challenges for law enforcement, forcing them to change with the times. • What’s a typical day like for you? I get a lot of direct contact with the residential community, the business community and the politicians in the area, and I’m responsible for the crime reduction. So every month, we meet with the chief of police during Comstat, and if we see crime spiking, say there’s a bunch of burglaries involving motor vehicles in the area, it’s up to me to figure out why it’s happening, what to do about it and reduce the crime no matter what it is. I see every police report that comes in, all the crime statistics on a daily, weekly and monthly basis, and I know if crime is going up or down and where the crime clusters are occurring. • How have the crime levels changed since the dawn of the NoHo Arts District? We’re actually now starting to see crime go up. North Hollywood, year-to-date, is up about 3% in crime right now. And it’s the shortage of police officers combined with the bad economy, and then we have issues with overcrowding in the prisons where a lot more prisoners are being release, that all contributes to the problem. But the inception of the subway is when it all started because with the subway came massive growth to the area, and it’s endless. North Hollywood is the last train stop coming from Union Station, it’s the last stop of the Orange Line, which extends to Chatsworth from the West Valley over to North Hollywood, you have a major bike path coming all the way from the city of Burbank through the West Valley, and now they have all these new bicycle lanes coming in. And then there’s the Greyhound Bus terminal at Magnolia and Tujunga. So you have all of these things bringing in more and more people everyday. It’s the busiest station out of all the Red Line stations. And a lot of the issues are from people coming into our community via the subway, committing a crime and then leaving. The good news is it’s not violent crime for the most part. We’re not having people getting shot or gang violence; we’re having cars being broken into and stolen, and some homes as well. But the car break-ins are our biggest challenge; we actually lead the city in property crime. And it’s because there are so many people here in a relatively small area, which creates an abundance of victims to choose from. If there’s a bad guy who wants to steal something, he’s going to go to the area where there’s an abundance of opportunity. And you can take a walk in any parking lot here and look inside ten cars and three of them will have something sitting in that car that can be stolen. It can be something as simple as a GPS device. • What are some of the other issues you deal with besides criminal activity? It’s not just criminal issues, but it’s social issues too. For instance, there were some violent crimes on Hollywood Blvd, and they increased the number of police officers there. So the presence of the LAPD has pushed a lot of those problem people off Hollywood Blvd and forced them to come here to the last stop of the Red Line. Also, if they’re trying to clean up skid row in Downtown L.A., we’ll start seeing a sudden influx of homeless people coming in off the subway. The other day, there was a camper in the park that had been there for three weeks, and it was brought to our attention that there was a three-month-old, a five-year-old and a mother and father who had all become homeless, living in this camper at the park. Because I’ve been here for a while and I’ve seen that problem before, I went to my friends over at Hope of the Valley and that night, they were in a shelter and out of the park. And you don’t learn that in the academy; that’s not a police officer’s responsibility, but it’s a human responsibility. • What do you have in place to lower criminal activity? We educate the community on a regular basis between the Internet and the billboards; we have neighborhood watch meetings where we educate them on ways to avoid being a victim, we teach crime prevention techniques for businesses and residents. We have this Lock It, Hide It, Keep It campaign all over the city where we’re encouraging people not to leave valuables in their cars. And we’ve created incredible relationships with the property managers in a lot of the residential buildings in the Arts District as well. In our kit room where we assign police officers cars and all of the toys that we use, there are keys for all of the apartments in the Arts District, so we have access into the underground parking structures inside each unit. We also have BID (the Business Improvement District), so if you’re walking along Lankershim, you’ll see guys in yellow shirts riding bikes, and they are our eyes and ears in the community, much like our residents? And as far as reducing crime in certain gang-infested, violent areas around North Hollywood, where people were afraid to be inside their own homes, we would make an arrest of the person involved in the gang activity, narcotics or violent crime- and we would follow up that arrest with an eviction of that person’s family. And it’s unfortunate that we had to do that, but that’s how we cleaned up a lot of the areas and got rid of a lot of the problem people. • What are some of the factors working against you? Right now, we’re working with the same amount of police officers today that we had in 2000. We haven’t grown as a police department, and that’s been our biggest challenge. We have about 240 police officers working the streets, give or take. And part of my job is to put something together to show this massive growth in the community so that we can get more officers from the LAPD assigned into the North Hollywood community on a permanent basis. And that’s been a real challenge. • What are some misconceptions people have about the police? We’re police officers. Yes, we take bad guys to jail, but there’s so much good that we do in the community outside of what is seen on the news. North Hollywood Park, for example, has one of the highest increases of crime year-to-date. And it’s because so many people are having hard times and are using the park and the library for shelter. The other day, a man was beaten up and hospitalized because he borrowed a library book from someone and didn’t return it. And we were able to go to him- he had fallen on hard times and was homeless- and because of the one-on-one relationship that I built with him over the last three months of him living in the park, we got enough information to ID and arrest the person by the next morning. So on the positive side, we’re making a ton of arrests, and with that, we’re hoping that the numbers start coming down and bring us to a negative number. • Do you feel any fear at this point in your career? You have to be afraid sometimes. I’ve had my name spray painted on walls with messages saying they wanted to kill me. And we respond to those types of situations collectively as a police department. We had a woman walk to a police station to give me a heads up that they were planning something. And that person came forward because I gained her trust; she saw changes happening in her neighborhood. And because of her, we were able to go after that person. So it’s working with and showing respect for the community and they show it back. • How are you able to work with people who may be afraid of talking to the police? That’s why we use the Internet system, or even calling somebody up and saying, ‘Hey, I’m in your neighborhood right now; I know you had a problem the other day. Do you have any additional information for me?’ But it’s the community contact that really keeps our neighborhood crime numbers falling. And it doesn’t have to be in person either; it can be via email, or they can call my work phone. And they can always remain anonymous and call the 1-800 number, and it will eventually get to us. • What have you learned doing this work? I’ve learned how to deal with a diverse community. We have a melting pot in this area, and I’ve learned a lot about myself. I think this job has made me a nicer person because I empathize with people and with different communities now, and I’ve learned how blessed I am with what I have. It’s really about doing something positive for someone else. • Why do you want to do this work? 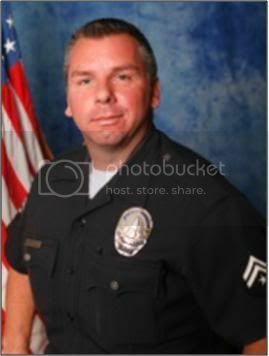 I’ve been in North Hollywood 16 years now, but I’ve been a police officer for 18 years. I worked the Venice Beach area for a while before I came out here. And I just really enjoyed the community; it’s very diverse. You can go from one extreme to the other. And I keep promoting, and I do a job that I really like. I probably have one of the best jobs in the city. I have a lot of responsibility as far as reducing crime, but I get to talk to people in the community on a one-on-one basis, which gives me the opportunity to help. It’s really about doing something positive for someone else. For more information on the Los Angeles Police Department, or for ways you can get involved, visit their website at lapdonline.org.